Hello everyone, I wrote about this program some months ago. However, I decided to come back to him because I thought there was much to say about it. If you have read the previous post, you know for sure that not much has been said in it, so let's start from the beginning. Getpaidto is a website that pays us for various types of actions, such as paid surveys, downloading apps on the phone, watching movies, listening to the radio, buying and even playing games! Regarding movies and radio, this option is unfortunately available to a few. Usually, only countries such as Canada, the United States, Australia and the United Kingdom have access to them. For other users, unfortunately this option will not be available. It does not matter because we can still make money on other things. The getpaidto site at the moment has a good reputation among users and accepts people from around the world. Unfortunately, your location also determines what offers you will have available, except games, because all the games are the same for all countries. 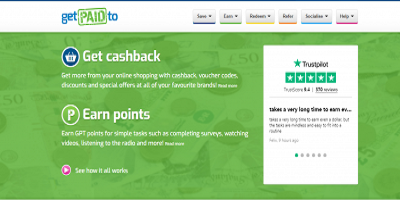 The best option, which I have not mentioned before is cashback. What does it mean? We simply buy in stores that have available parts return on the website. It can get up to 10% of what we spend, I think it's a lot. You spend $ 100 you get $ 10. Cool. Another options are paid surveys, films and listening to the radio. Here you probably do not have to say more because the name explains everything. The last option for earning is playing games. We will not earn too much in short time, but practically if we do not have anything to do with our time. This is a great option, we just play and earn money. The earnings for playing depend on how much time you spend and in addition in which country you live. In addition, the better result you achieve the better, because people with the best achievements have a chance to get extra money. Earned money can be paid after collecting 500 points, which is the equivalent of $ 1. The payday options available are: paypal - for everyone and the bank, but not for all countries. I use the first option myself. Getpaidto is a great website for making money online. He has many forms of earning available. The site is available to everyone, that is, if you have a computer and internet you can make money from it. The low minimum to withdraw funds only encourages registration. Do you want to be up to date? I invite you to subscribe to the blog. Any comments please submit via our contact form, which is available at the top of the page.